There were no signs or symptoms previously, she has always been a healthy little girl, happy, active, playful and bright – no causes for concern. She caught a tummy bug, and it quickly spread to Mummy and Daddy, but everyone got over it and Lottie remained the same, just under the weather. She went to the childminder, and her sister mentioned Lottie’s tummy looked different that day. Mummy collected Lottie early and went to the GP. The GP sent us to the hospital, and they did an X-ray and said Lottie had a blockage in her bowel and was most likely malnourished. Lottie’s favourite food was broccoli and sweet potato curry, she’s always had a broad spectrum of healthy foods. They then did an ultrasound…. Mummy and Daddy were told it was likely to be cancer. 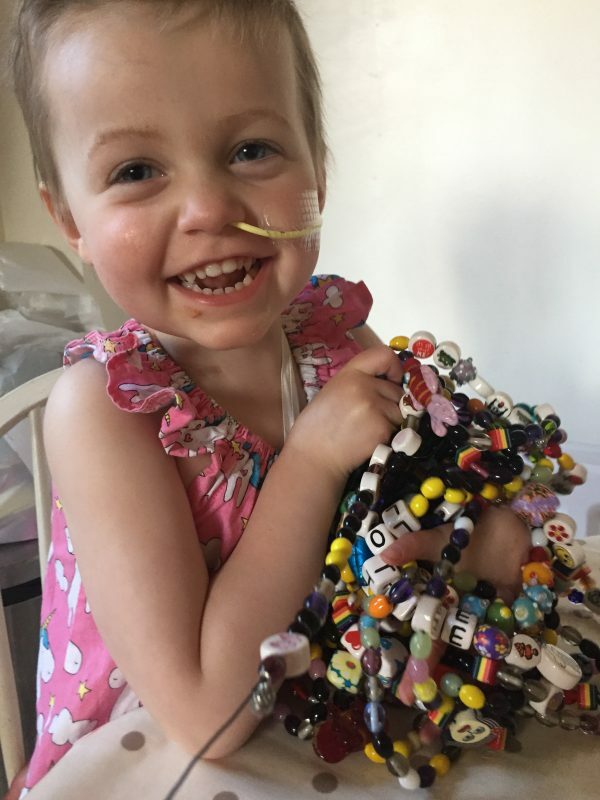 Within the hour we were placed in protective isolation at the local hospital and the Royal Marsden, Kings, St George’s and the Evalina were all consulted regarding Lottie’s high blood pressure and increasing abdomen. Three days later and a transfer to St George’s was complete. Mummy and Daddy prepared for a biopsy, a Hickman line fitting and a bone marrow aspirate. Nanny slept on the floor at the end of Lottie’s bed, whilst Mummy slept in a chair and Daddy went home to look after Georgia and Jack. We were devastated, but had to remain strong. 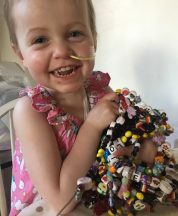 Lottie went downhill very fast and was placed in PICU at St George’s, the mass was squeezing her lungs and affecting her blood pressure. It was splicing her diaphragm and she could no longer breathe on her own. We waited three agonising days for a diagnosis. No chemo can start until a diagnosis is reached. On the 30th June at 1:15pm Dr Zacharoulis delivered the news. Neuroblastoma. Chemo was started that night. Immediately Lottie improved. Seven days later she was transferred to The Royal Marsden. Seven rounds of chemo, three kidney function tests, numerous blood tests, countless nights in hospital. X-rays, CT Scans, bone marrow aspirates, general anaesthetics, NG tubes and so much more later we are fighting stronger than ever for our baby girl. On the 25th of October Lottie had the now 3.6cm tumour removed. A gruelling 12 hour operation made successful by the amazing team at St George’s. Lottie then spent seven days in PICU, this timed sedated on a ventilator to keep her safe. Lottie is now undergoing treatment in the USA. We fundraised for her treatment with Solving Kids Cancer and raised a massive £155,000 to pay for a Vaccine Trial. Lottie travels back and forth to New York with her Mummy, so she misses long periods of her time at nursery. Lottie has lots of anxiety and needs a clear routine to keep her panic levels low. She also has lots of tests, such as bone marrow aspirates, PET Scans, and Ultrasounds. She is also experiencing Hypoglyceamic episodes, which means she needs close monitoring as they come on very suddenly with no warning. Lottie can’t tell us when these are happening so we need to watch out for any tiny little signs. Her legs are very heavy and she struggles a lot with her balancing and running – some days are better than others. Currently Lottie is in remission and the Vaccine hopefully will keep her there. Lottie is now in her immunotherapy phase of treatment having undergone; surgery, stem cell transplant, radiotherapy and now immunotherapy. Immunotherapy is causing lots of pain and issues that stop us leaving the house. I’d like to thank everyone for their lovely cards, post, stickers and happy mail, they brighten our day!